Quiet and cozy apartment with sea and mountain views just 75 meters from the beach. This lovely apartment has a fireplace and a wonderful terrace with sea views in a setting of pine trees, giving you the feel of a bird's nest. It is only 75 meters far from the beach. The bedroom is large and very alight, as it has a big window facing a nice mountain view of the village. The dining room has a sofa bed suitable for children or young people. The fireplace makes it a great place for an autumn getaway, when the town is a little quieter. The kitchen is very well equipped and the bathroom functional. This apartment has a very large rooftop terrace shared with another resident of the house (the only two apartments), where you can dry clothes in the sun as well as it is great or to be used for sunbathing, reading surrounded by nature, or play with your kids. We recommend come to Tamariu by car, as public transport in Tamariu is very limited and it works only in the summer months. 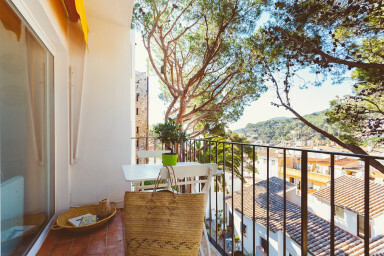 This peaceful apartment is perfect for a couple (with or without kids, as there's a sleeper sofa in the living room) The balcony opens up to a view of Tamariú's roof tops through the wonderful fine trees that grow from the floor below and attracts songbirds, and beyond, a glimpse of the sea. Margarita and Jesus were excellent and correct hosts, and we had a wonderful time in this quaint little village. Recommended! Amazing place. Amazing view. Great hosts. Highly recommended. Recomendamos este apartamento por su ubicacion, tranquilidad y sobre todo por la vista que tiene. Para 4 personas queda un poco pequeño pero el balcon lo compensa. The flat is small but clean and has a nice balcony, from which you can see pine trees and the sea. The bathroom has a smell of sewage which is apparently a problem in the town, so you'll want to keep the doors closed. We had a nice, relaxing stay in Tamariu. Thanks beach is a 5 minute walk down the steps from the flat. Perfect location, beautiful view, small appartment but with everything we needed.